This is meant as a follow-up with more personal reflections to accompany my earlier post on the Iconostasis in Orthodox Churches. I know from my many conversations with bright young seminarians (two of whom are married to my oldest daughters) that there is much, much more to know about the history and development of Eastern liturgical practices than I begin to know, despite my years of reading. But I do know something about piety, particularly the piety found in our modern American experience – and I know my own experiences as well. So this short piece will focus on those things and hopefully shed some useful light. Some years ago when our mission was first starting, we worshipped in an empty warehouse (quite a small warehouse I might add). There were two icons, Christ and the Theotokos, set up in the front of the room, and a small analoy from which the Reader led the service. We built an altar and set it in place. It was only used by visiting priests – which was about every six weeks at the time. We discussed building an iconostasis. We decided the easiest thing to do was to build a wall (framed with sheetrock) with three openings. We eventually added doors, etc. What I most remember was the labor that we put in over the course of a Saturday. By the end of the day the wall was complete, but not painted. We measured and hung the two icons. It was a modest affair, but the impact was huge. I remember looking at the altar, now seen through the “royal” door space, and thought to myself, “Now it truly seems to be an altar.” What I noticed was that the wall (about the best we could do at the time) did not cut me off from the altar, but instead “revealed” the altar to me. Without the iconostasis it was not obvious what the table was. Now it was clearly an altar, albeit simple and quite makeshift. Human beings need boundaries – they are inherently part of a healthy life. They “define” things for us. Without them everything becomes confused and without meaning. If you will, the Incarnation itself is God within human boundaries. Christ revealed God fully and truly for the first time. This is one of the main hallmarks of Orthodox dogma on the Holy Icons. We make icons of Christ not because He became man, but because He became “a man.” There is a great deal of difference. I cannot paint a picture of “humanity.” I’ve seen some bad “publicly funded art” (as my children call it) that seeks to do something like portray “humanity,” but, of course, it always fails. You cannot paint human nature, or any nature. You can only paint a man. St. Theodore the Studite in speaking of this referred to icons as “hypostatic representations,” meaning, images of the person, not the nature. We might use certain symbolic images to point to the nature (such as a halo, etc. ), but you cannot paint the nature of someone or thing. Even in Orthodox Churches that are “minimalist” when it comes to the iconostasis, still have enough definition that you know where the altar is and that it is an altar. There is still a “going in” and a “coming out.” It may be possible to see more, but there is enough definition that the seeing knows what it sees. I think this is an important matter in modern piety, precisely because we live in a culture where boundaries are being demolished at a fearful pace. I have worshipped (when I was an Anglican) in settings where the altar was in the middle of the Church and everyone surrounded it. I would not criticize this as though it invalidated the actions that took place – but the “democratization” of the liturgy can make the emphasis be on us, the worshippers, rather than on God, the worshipped. Of course I’m now making an argument based on my own subjectivity, so I’ll readily admit that there’s plenty of room to disagree. But I am certain in my heart, that definition, boundaries, whatever we want to call it, is very important for us today – perhaps even more than at any other time. It is important for us to know that we cannot have something or someone just because we want it. That God is accessible by invitation and gift, not by right. I also believe that the boundaries manifest in Orthodox worship are helpful to us in discovering the boundaries that exist within our own souls. I have taught and continue to teach that we human beings are constructed much like a Temple (indeed our bodies are called “Temples” in Scripture). There is a narthex, a most public part of who we are. There is a nave that is less public but still a place where “family” gathers. But there is also a Holy Place, the heart, where we “sup” with God. This is a most intimate place and must not be thrown open to any and all. There is a place within us where we need “to remove” even our own shoes (much less letting others stomp around in there). Interestingly, and I think this is important as a matter of piety, even as a priest I do not enter and exit the altar area lightly. There is a proper way for a priest to enter the altar and proper ways for him to behave when he is there. This has been personally important for me as I struggle to know God. Regardless of the evolution of the iconostasis, the prayers in the liturgy are quite clear in their attitude to the altar. There is an “iconostasis” of some form that is encountered in the prayers that a priest says (aloud or quietly depending on parish practice) in which he acknowledges that he stands somewhere he doesn’t deserve to be, and beseeches God to have mercy on all who stand at that table with him. 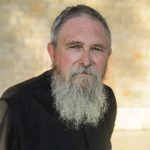 I have been particularly struck in concelebrations with other priests when the prayer asks that “no one around this table be struck with confusion.” I know that the meaning of the prayer has to do with confusion of soul, and yet it also makes me think of my own liturgical confusion as I make my way through the complexities of the service. Whether we are describing an iconostasis that stretches almost to the ceiling, or nothing more than two icons on easels, the same boundary is being drawn and the same statement being made. One just says it louder than the other. And what it says, I believe, is something I need to hear. The photo is the iconostasis in St. Paul’s, Las Vegas – doubtless a city where having something that announces boundaries could be very important. It is a wonderul temple in which to worship. Yes, Fr. Stephen it is a beautiful Church. I celebrated Pascha there one year, about three years ago, when my Dad whas sick. Wonderful choir, great community, Fr. Eric is a nice man. Its a jewel in the desert. I would love to see other people’s churches, Fr. Stephen have you got one of St. Anne’s? Again, go to a novus ordo mass before you worry about the iconostasis blocking your view of Christ. I promise you that you will change your mind. The bread looks the same both before and after the consecration. God bless the rood screen and iconostasis. They are dignifying. during St. Basil’s episcopate, it is recorded that he instituted the use of a curtain to cut off the altar because his deacons could not quit staring at women in the crowd. How’s that for practicality?? I’m thinking of the time our priest held a funeral for a man who was the only Orthodox in his family. The grown children came early to arrange the flowers at one point — not sure why *they* were doing this — and, as the parish secretary, I happened into the church just as one of the daughters was traipsing in and out of the sanctuary to access the water supply for the flowers. I showed her another door, she used that, end of story. But I remember this event because of my own reaction — when I saw her entering the sanctuary so casually, I gasped. And then I reflected that just ten years earlier, I wouldn’t have thought anything of it. As for the democratization of Western churches — that was an interesting reaction, too. I used to attend daily Mass at a St. Christopher’s in NYC, over on East 43rd Street (it’s closed now), that had just such an arrangement. And I liked it very much. Felt more like “family.” But ya know — it *did* put the emphasis on us. It felt like family. It wasn’t about worshipping God at all. Hm, interesting. The royal door frames the sacred space, saying “Look here!” The iconostasis also reminds us that much is hidden that is yet to be revealed. As I reflect on my own “temple” (myself) I am increasingly aware of the wisdom of the Church in constantly confronting me with the deep mystery of my own person. We are all too often too “familiar” with holy things. The icon screen was once starkly off putting to me as a Protestant, but now I find the clear “thresholds” of Orthodox architecture to be both a sermon and a path for my own spiritual journey. It has also taught me to watch how I deal with other people. The “easy familiarity” of modern personal interaction is a denial of the sacredness of each person we meet. I never will forget speaking to a man who understood this long before I ever did. In our discussions, I began opening up to this man about some deep struggles. As I did this, he began to weep. When I asked him why, he said he felt overwhelmed by the honor of being invited into the “holy of holies” of my heart. I never looked at him or myself the same again. I enjoyed this post and the previous one and am pleased as punch to see my parish iconostasis displayed as your picture. When were you here? Handmaidleah, we were both there that night. Funny to learn this 3 years later on a blog site, which gets me thinking about those brushes with others that I will never know perhaps in this life. Father, in understanding the iconostasis in this manner, as creating boundaries so that we can “see” what needs to be seen, I believe this is one of the manifold glories of the Orthodox Faith as a whole, that boudaries have been established once and for all, and those with the eyes to see will see. Somehow, in Orthodoxy, I believe that when we realize truths anywhere, these truths apply everywhere. By this I mean that in seeing a part of the “essence” of the iconostasis in this manner, truths and understandings become a greater part of the working psyche, enabling the soul to perhaps perceive realities in other things, discernable on a level that words are difficult to explain, even to the consciousness, the nature of one is now experiencing. Perhaps, Father, this could be part of what our spiritual athletes mean when they speak of the “eyes of the soul” seeing God? These are just thoughts for me to ponder and I would like to hear your understanding of these matters if I made ANY sense to anyone but me. The first time I saw an iconostasis after having grown up in an Evangelical church I thought of the curtain torn during Christ’s crucifixion. However, what I first saw in the iconostasis was precisely that it highlighted that we now meet God through the rent curtain as the priest brings out the Mysteries and the people come forward to partake. Like Fr. 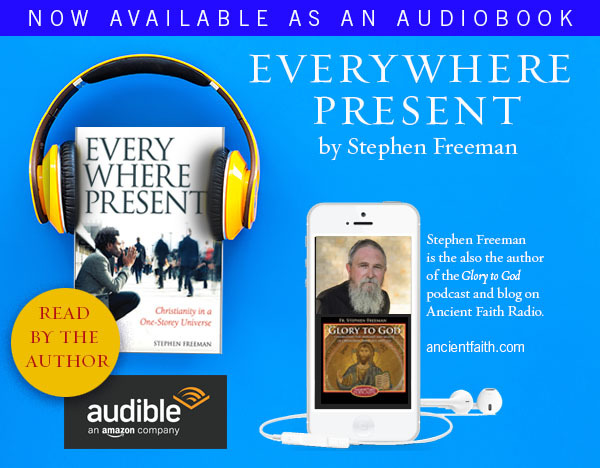 Stephen said, it gave definition to what was going on and gave me both a sense of the holy and of our access to the Holy One rather than our partition from Him. As an Evangelical, our lack of iconostasis never made me think of the curtain having been torn (only a torn curtain would make one think of a torn curtain), my mind never thought of us our worship as an “improvement” upon Jewish worship because there was nothing there to make me think of Jewish worship in the first place. As Schmemann said, we need both continuity and discontinuity. As a Protestant I never left church thinking I should see all places as sacred as I did in church, rather I came to church thinking it was a place like any other place. I’m glad I don’t see things that way anymore. Glory to God. I was in Las Vegas in February 2006 (actually landed there and went on to the Grand Canyon and Zion Nat. Park. Came back on Sunday and concelebrated with Bishop Benjamin and Fr. Jannakis from Michigan. Fr. Eric, sadly was out of town with family. It was a delighful service nontheless. I have frequently admired photos of your Church. It’s quite striking. Thank you for your thoughts on this subject. You have opened my mind to a deeper understanding and given me many things to ponder. These meanings within meanings, this level upon level of undersatnding is one of the most striking features of Orthodoxy. 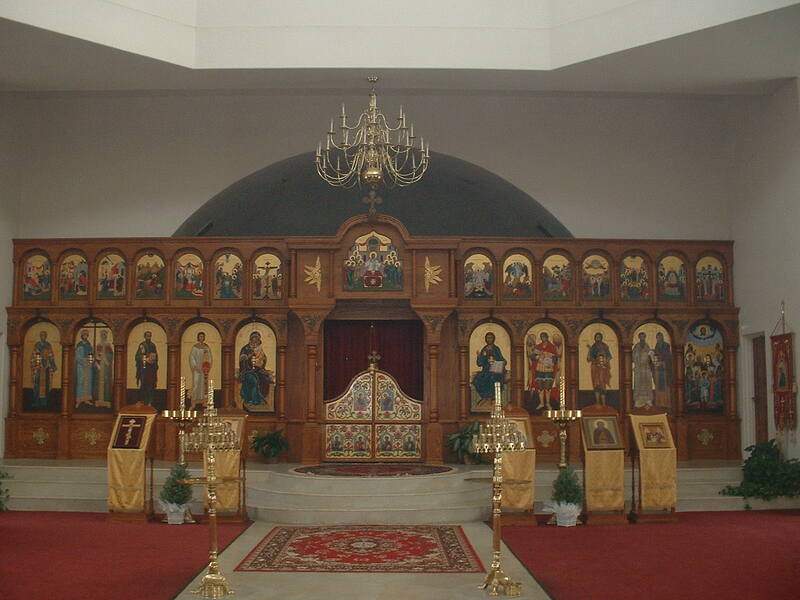 Here is an example of a mission iconostasis. It is not exactly beautiful, but it is a start. We have to be able to set up and knock down quickly since we are using a space in a presbyterian church. May God soon send us more people and a place of our own. I can’t thank you enough for this entry – it grounds and magnifies some other encounters I’ve had with people lately, and is so very helpful (almost incomprehensibly so) that I am without sufficient words. Sophocles, I understood _exactly_ what you were trying to communicate. I love your candle stands! Those are really great, and how can anything that has our Lord and Lady on it not be beautiful? Sometimes we forget how fortunate we are to have established churches, Colorado is truly blessed in that regard, we are heavily Christian and growing in Orthodoxy. I was the lonely woman standing on the right side near the very front of the church. I was all alone that year, sadly but grateful to be in such good company. I left right after the services to get home and help with my Dad, but I remember it as a joyous time. Fr. Lawrence Gaudreau was still there, so my timing has to be three or four years ago… He is at St, Mary Holy Dormition in Calhan, CO now. Time flies! Interestingly enough, the closing scenes of my script on Lewis and Tolkien is partially based on an passage mentioning a rood screen in Tolkien’s critique of Lewis’s last book (“Letters to Malcolm”) that the Tolkien estate won’t let out. We only know this one passage because Tolkien’s biographer Humphrey Carpenter quotes it in “The Inlkings”. The rest has not been seen by the public. This may have been mentioned, and it may seem a bit simplistic; but I’ll offer it anyway…..
One of the *means* by which heaven and earth are united is the icons. Icons cover the iconostasis; the wall is nothing but a supporting structure for those icons on it. Hence, the iconostasis is but a further testimony of the union of heaven and earth in Orthodox worship. The real intent of the iconostasis is not to separate, but unite. Once I arrived early for a weekday liturgy at a Ukrainian (Catholic) church. I only saw 2 cars in the driveway, and the church seemed to be locked. I rang the rectory doorbell. The priest answered the door, dressed in a t-shirt and shorts. I was surprised, but it was summer, and extrememly humid. It turns out I read the bulletin wrong. No liturgy. The cars were early arrivals for a Ukrainian War Vets meeting. Since I made the long walk, and was melting from the sun, I asked the priest if I could go into the church to pray (and cool off.) He obliged, and unlocked the side door that leads directly into the nave. I paused to let him pass first, but he waved me through, saying “Please. I do not want to go in dressed in this way.” I never forgot that.